At the eleventh hour, on the eleventh day of the eleventh month each year New Zealanders remember the end of the First World War. 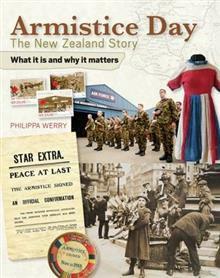 Armistice Day, Philippa Werry's new book for children, commemorates the day when fighting stopped in Europe. Partnered with best-selling Anzac Day,... read full description below. the battlefields overseas to visit graves of their loved ones. and New Zealand's role in international peacekeeping. Philippa Werry is the author of Anzac Day: the New Zealand story, shortlisted for the New Zealand Book Awards, Best Mates illustrated by Bob Kerr, and Waitangi Day with New Holland Publishers. Philippa lives in Wellington and visits schools around the country as part of the Writers in Schools programme.